WELCOME to “The Old Manse” in upper Tobermory, set in peaceful seclusion but only 5 mins away from the bustling Main St. of pretty colourful houses around the bay. From the moment you come through the wrought iron gates (probably to be met by Sasha our Bernese Mountain Dog!) you will enter a different world. We have a wonderful situation with a glorious panoramic view overlooking Tobermory Bay, The Sound of Mull and the Morvern Hills beyond. 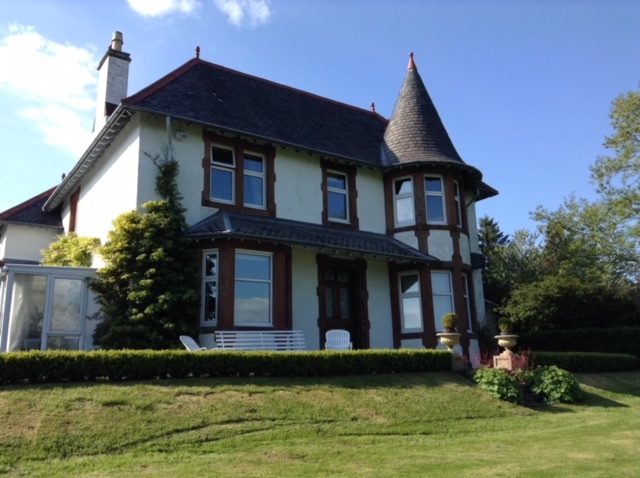 Our home was built for the local Minister in about 1900 in Scottish Baronial style, complete with turret by the architect and builder of the castle at Lochaline. We are now a family home complete with all the original character brought right up to date. The house is full of antique furniture and elegant soft furnishings for your comfort. We offer two double bedrooms (on the first floor) with beautiful private bathrooms. One has a 5ft.king size bed and is overlooking the bay at £115 per room, per night, (double or single occupancy,) and the second is a double with 4ft. bed overlooking the Church, the village and beyond to the hills at £100 per room per night (double or single occupancy). We have a large garden with blue and whitebells in the copse, and we are surrounded by rhododendrons and azaleas. There are herbaceous borders too and a kitchen garden and greenhouse to help supply our needs. There is a sunny and very comfortable private sitting room for guests overlooking the bay and the Sound of Mull, and as avid readers ourselves there is an abundance of books. Breakfast is served in the heart of the home, the kitchen/breakfast room, cooked on the Aga. We only serve good quality and source the best local produce wherever possible. Wi-fi available. Arrival late afternoon by arrangement and check out please by 09.30am Sorry no pets, and children only by arrangement. No smoking or vaping inside the house, thank you. Payment by Cash or cheque. The Smart family have been in the baking/catering/hospitality industry for generations, do e-mail Heather at [email protected] or phone 01688 302212 or 07759 078588 for availability.